This episode saw the dramatic conclusion to Christopher Bailey’s debut to Doctor Who, ‘Kinda’. It is a fantastically rich and seductive story, if a little bewildering. Heavily influenced by Buddhist concepts it also features some Old Testament visual references, such as Deva Loka’s appearance as a form of the Garden of Eden and the serpent. This is Doctor Who at its most creative, psychedelic and bold. It also presents the companions in a new way; as liabilities. Nyssa is removed from the story altogether due to contractual reasons. Tegan is responsible for causing the events and Adric proves his childish incompetence when trapped in the TSS machine. In fact this episode includes Adric squabbling with Tegan like a child in an embarrassing display of Alzarian arrogance and blaming her for the Mara’s return, although these scenes were late additions to ‘pad out’ the episode to its required running time. 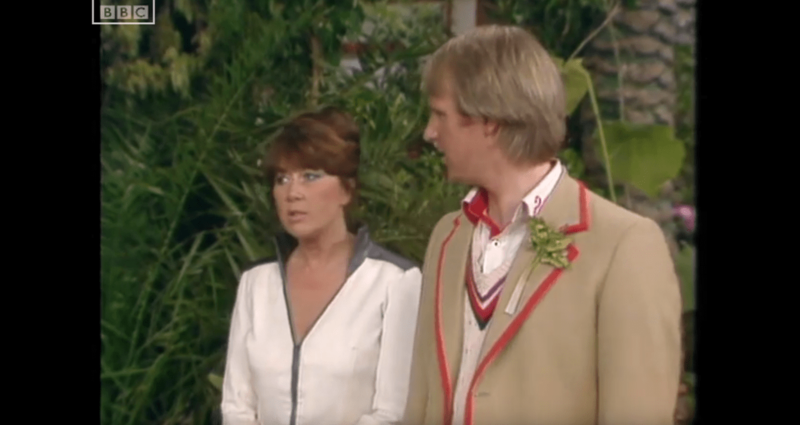 It is no wonder therefore that the Doctor is paired up with the far more intelligent Todd played by lovely guest actress Nerys Hughes. From the very start of the episode the imagery is very dramatic, time is running out and although the focus is on the Mara’s crossing over from the dark places of the inside into the real world, the most terrifying individual by far is Hindle. Simon Rouse is frankly astonishing as Hindle. Full of paranoia and instability, his character’s strategy for coping with the dangers he perceives to be outside of the dome is to return to a childlike state, creating a city and cut-out people to live with in it. His reaction when the Doctor accidentally steps on one is dramatic and intense and triggers the Time Lord to be uncharacteristically violent in order to prevent the destruction of the dome. The mysterious box of Jahna not only provides one of the serial’s incredible cliffhangers, the fear and terror being found in the unknown contents, but also effectively cures Hindle, bringing his mind “back into phase”. Unfortunately, the conclusion to the episode and the story is let down by an unrealistic snake prop, which had to be used as ironically time slipped away from the production team in the studio. However, one of the triumphs of the Classic DVD range has been the inclusion of new CGI which creates a truly horrific snake and a far more fitting finale.